Objectives To investigate the association of maturity status with injury incidence in Middle-Eastern youth athletes. Setting Four consecutive seasons (2010–2014), Aspire Academy, Qatar. Participants Male athletes (age range: 11–18 years) representing four disciplines enrolled and grouped into two categories: individual sports and racquet sports. Outcome measures Injury data collected over four seasons. Athletes’ anthropometric characteristics assessed to calculate age at peak height velocity. Predicted mature heights (PMHs) collected and categorised into four quartiles. Athletes had wrist and hand radiographs for assessment of skeletal age (SA). Early and late maturers with an SA of >1 year older or younger than their chronological age (CA). Results For the sample (n=67) across all groups, 43 (64%) athletes had one or more injuries: total of 212 injuries, 4.9 injuries per athlete across study. Survival analysis of maturity status using SA found early maturing athletes had two-fold greater injury risk compared with late maturers (HR 2.04, 95% CI 1.15 to 3.61, p=0.015). PMH associated with injury risk (HR 1.05, 95% CI 1.01 to 1.08, p=0.006). Athletes in fourth quartile (≥184 cm) had up to two-fold injury risk (HR 2.41, 95% CI 1.42 to 4.08, p=0.001). Racquet and individual sports involved similar injury risk (HR 1.14, 95% CI 0.86 to 1.52, p=0.37). Conclusion SA early maturity and PMH gradient were significant predictors of injury in youths. First longitudinal study to assess anthropometric characteristics and biological maturity status as injury risk factors in Middle-Eastern athletes. Participants were highly trained adolescent athletes. Measurement of maturity and growth were at moderate-to-high risk of bias. Skeletal age has major limitations in expense and minimal radiation and lack of knowledgeable staff for assessment and interpretation of results. A number of studies have been conducted involving injuries in adolescent footballers; conversely, few studies have focused on injuries in non-footballer adolescent athletes in high performance sporting environments.21 Studies of anthropometric characteristics and biological maturity status as injury risk factors in Middle-Eastern youths are also limited, highlighting the need for more research in this area. Therefore, the purpose of the present study was to investigate injury incidence according to biological maturity using two outcome measures (SA and PHV) in highly trained youth athletes based at a Middle Eastern Sports Academy. Sixty-seven highly trained adolescent athletes (age range 11–18 years) representing athletics and racquet sports (table tennis and squash) from a Middle-Eastern sports school were included in this 4-year study. A prospective, longitudinal cohort design was used and included separate observation periods over four consecutive seasons (2010–2011, 2011–2012, 2012–2013 and 2013–2014), ie, school years, which lasted from the beginning of September until the end of June (~40 weeks). Participant maturity assessments included both anthropometric measurements, collected three times a season, and SA assessments using Fels method completed once, at the start of every season. Medical screening was performed at the beginning of each season to determine health and injury status. All selected athletes had clearance from a physician to participate in their respective sport. Written informed consent was sought and obtained from parents and assent from all participants. The study was part of a general sports science provision to the sports academy, and all procedures were reviewed and granted by the Institutional Review Board for Human Subjects and conformed to the recommendations of the Declaration of Helsinki. 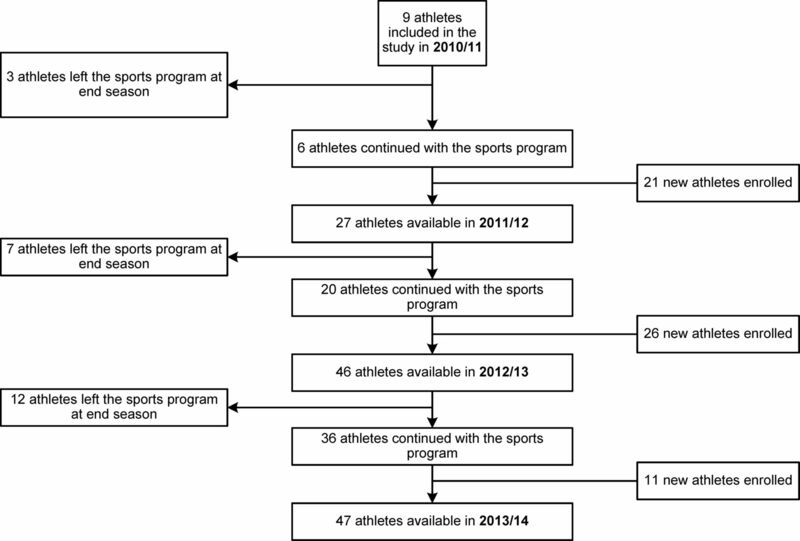 Figure 1 shows the flow of participants in the study over consecutive seasons. A total of four sporting disciplines were analysed, grouped into two categories: athletics and fencing and racquet sports (squash and table tennis). This classification was based on specific sport characteristics and injury risk.22 23 Inclusion criteria were as follows: (1) the athlete had to be enrolled in the sports school during at least one full school year; (2) athletes with injuries in previous seasons were not excluded from this study, but injuries present at the beginning of the observation period were not included in statistical analyses; and (3) injuries that were not sustained in the context of the sports programme (eg, recreational activities) or data related to sickness or other general medical conditions were not used for further analysis. Flowchart describing the inclusion and flow of participants throughout the study. All injuries were collected by a physical therapist (AR) with experience of working within youth sport. Data from medical records were used to document all sports related injuries during the study. Each sporting discipline had a dedicated full-time physiotherapist and a full-time employed medical doctor at the sports academy. The medical record used an injury reporting system based upon the football injury reporting system25 and the Sport Medicine Diagnostic Coding System.26 Information was gathered concerning all injuries related to sports activity, including several related variables (eg, type, location, affected structure, mechanism [acute vs overuse], time loss, severity and date of injury). Anthropometric measurements were initially carried out on all participants on a 3-monthly basis along with an estimation of the APHV as a relative indicator of somatic maturity and representing the time of maximum growth in stature during adolescence using Mirwald method27 for the prediction of growth.1 APHV was calculated from the first measurement recorded. To ensure that the outcome measures remained consistent and reliable, every effort was made to ensure that measurements were taken at approximately the same time of the season. Measurements were collected by qualified practitioners from the International Society for the Advancement of Kinanthropometry and included stretch stature (±0.1 cm Holtain Limited, Crosswell, UK). The predicted mature height (PMH) of all participants were collected and categorised into four PMH quartiles (Q1–Q4: Q1 <176 cm; 176 cm ≤Q2 < 180 cm; 180 cm ≤Q3 <184 cm; Q4 ≥184 cm). The athletes were then divided into three maturity groups (late, normal or early maturing) based on the mean ±1.0 year of the APHV of the total sample (late, APHV >mean + 1.0 year; normal, APHV within mean ±1.0 year; early, APHV <mean – 1.0 year). Years from peak height velocity (maturity offset value: CA—maturity offset) was calculated by subtracting the CA at the date of injury from the age at estimated peak height velocity. Each year athletes were required to have a radiograph of the left wrist and hand, a convenient area to examine, and a more accurate method for the assessment of SA,11 using the Fels method6 28 which has an advantage over other methods.29 Maturity status, defined by the difference between CA and SA was calculated and classified into four categories: late, normal, early and mature athletes. Late referred to an SA that was younger than CA by more than 1.0 year, athletes with a normal pattern of maturity had an SA that was within 1.0 year of CA, early referred to an SA that was older than CA by more than 1.0 year and the closure of growth plate determine skeletally mature athletes. Data were analysed usingStata 11.0 statistical software. Descriptive statistics were presented as frequencies and proportions (%), and incidence rates were expressed as the number of injuries/number of registered athletes. To examine the role of growth status and maturity with the onset of injuries, a univariate Cox regression survival analysis was performed after accounting for repeated visits of athletes over the four seasons. HR with 95% CIs were reported for each factor. Kaplan-Meier curves were plotted for SA groups and time to injury over a season. Where appropriate, 95% CIs are presented. The alpha level of significance was set at 5%. Patients and public were not involved in the analysis of this study. Throughout the 4-year seasons study period, 67 athletes were enrolled representing 151 athletic seasons. Table 1 presents the anthropometric characteristics of participants and their maturity status. From these participants, 43 (64%) reported one or more injuries adding up to 212 injuries in total. The injury rate observed per registered athlete amounted to 4.9 injuries over the course of four seasons. Among all participants (n=67), 4% were classified as late maturers, 33% as normal, 41% as early and 22% as skeletally mature. The overall injury free survival analysis of maturity status using SA assessment indicated that early maturing athletes had a two-fold higher risk of injury over a season compared with late maturing athletes (HR 2.04, 95% CI 1.15 to 3.61, p=0.015), (figure 2). There was a trend that early maturing athletes had a greater risk of injury over a season compared with normal athletes (HR 1.62, 95% CI 0.99 to 2.65, p=0.053), but this was only marginally significant. However, injury risk among late and fully mature athletes did not differ from normal maturers. 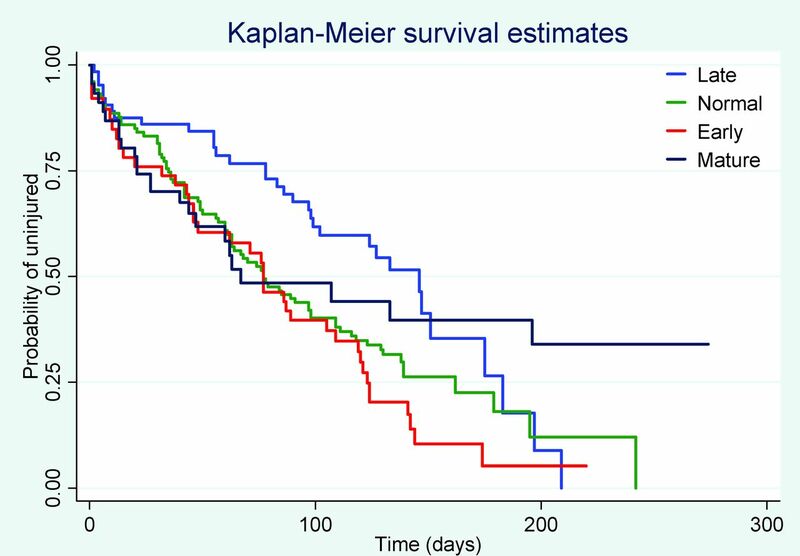 Kaplan-Meier survival analysis of injuries in relation to different skeletal age maturity status. Using anthropometric measurements, among all participants (n=67), 6.0% were classified as late maturing, 85.8% as normal and 6.0% as early. Classification of participant maturity status (late, normal and early) according to age at PHV (APHV) was not significantly associated with overall injury incidence in this cohort of highly trained Middle-Eastern youth athletes. Older PHVs were marginally associated with higher injury risk, but this was not statistically significant (HR 1.11, 95% CI 0.99 to 1.23, p=0.067). Both PMH (cm) and %PMH were found to be associated with injury risk (HR 1.05, 95% CI 1.01 to 1.08, p=0.006, and HR 1.03, 95% CI 1.00 to 1.06, p=0.026), respectively. When compared with participants in the first quartile for PMH (<176), athletes in the fourth quartile (≥184 cm) had a two and half times greater risk of injury (HR 2.41, 95% CI 1.42 to 4.08, p=0.001) over a season. No significant differences were observed in the injury risk between racquet sports (n=30) and individual sports athletes (n=37; HR 1.14, 95% CI, 0.86 to 1.52, p=0.37). The present investigation was carried out to examine injury incidence according to maturity status. Biological maturity status and height gradient play a significant role in injury risk profiles of highly trained youth athletes. The results of the current study show that athletes maturing at a younger age are at significantly greater risk of injury, more than two-fold, compared with their later maturing counterparts. Taller athletes were also found to be significantly more at risk of injury. However, our study results were inconsistent with other study30 on youth athletes, in which late maturing athletes have a higher injury rate compared with their earlier maturing counterparts. A plausible explanation could be that Fourchet et al 30 examined anthropometric data collected from a track and field cohort for their findings, while our study resulted from maturity status derived from bone age but with no substantial association from APHV. PMH and %PMH at a given age are minimally invasive, feasibly practical indicators of somatic maturation,17 35 especially if mature height can be assessed without an estimate of SA.28 In this study, the PMH and %PMH revealed that both indicators were associated with injury risk (HR 1.05, 95% CI 1.01 to 1.08, p=0.006), and HR 1.03, 95% CI 1.00 to 1.06, p=0.026), respectively. When compared with participants in the first quartile for PMH (<176), athletes in the fourth quartile (≥184 cm) had two and a half times greater risk of injury (HR 2.41, 95% CI 1.42 to 4.08, p=0.001). The present results are partly in line with previous studies on other sports. Johnson et al 6 showed that gains in height in youth footballers over a season were associated with an increased number of injuries. The study of Kemper et al 36 on elite youth soccer players with growth rates of at least 0.6 cm/month showed a higher risk for injury. In a different study on soccer athletes, it was found that the tallest boys had the highest incidence of injury.37 However, these findings and those of the present study are not in line with a study on youth football players,38 in which injured and non-injured players did not differ in percentage of mature height. An explanation could be that the definition of reportable injury in the methods of the study, which considered only time loss injuries, did not capture the full spectrum of injuries and therefore overlooked other injuries with insidious onset eg, growth conditions. The findings in this study have several implications for youth athletes. First, our data suggest that adolescent athletes might be identified and selected with a preference for youths with advanced maturity. Such selection strategies which favour early maturers entail significant risks of injury. Accordingly, those involved in the selection and development of young athletes should be cognizant of temporary changes in motor control that may occur during these periods,45 consider maturity status, develop appropriate training programmes to optimise training adaptation, design injury prevention plans to minimise activity related injury risk and mitigate long term youth injury consequences. Limitations of the current study should be noted. First, biological maturation methods have inherent limitations when applied to youth athletes and need to be applied with caution. Although SA is a gold standard indicator of maturation, it has major limitations in expense and minimal radiation and lack of knowledgeable staff for assessment protocols and the interpretation of results.46 Although our sample size is small, we have a follow-up over four seasons. Another limitation, we had no data on training or competition exposure, which reduces the comparability with other studies reporting injury incidence. The findings of the present study showed that maturity status plus PMH and %PMH are associated with injury in individual and racquet sports but no association has been established between APHV and injury. As SA varies individually in rate and timing, and mismatches in maturity may create competitive inequality and increase injury incidence, it is suggested that biological maturity should be considered during training to help prevent injury. Given the peculiarity of youth athletes it is important to optimise the planning of training activities to further improve the understanding of the link between training, growth and injury. The publication of this article was funded by the Qatar National Library.
. Maturity status of youth football players: a noninvasive estimate. Med Sci Sports Exerc 2005;37:1044–52.
. Assessing causation in sport injury: a multifactorial model. Clin J Sport Med 1994;4:166–70.
. Epiphyseal growth plate fractures. 2007.
. Overuse injuries are prevalent in children’s competitive football: a prospective study using the OSTRC Overuse Injury Questionnaire. Br J Sports Med 2018:bjsports-2018-099218.
. Relationship between injuries and somatic maturation in highly trained youth soccer players: Int Res Sci Soccer II, 2016:182–92.
. 2018 International Olympic Committee consensus statement on prevention, diagnosis and management of paediatric anterior cruciate ligament (ACL) injuries. Knee Surgery, Sport Traumatol Arthrosc 2018;0:1–17.
. An assessment of maturity from anthropometric measurements. Med Sci Sports Exerc 2002;34:689–94.
. Predicting adult stature without using skeletal age: the Khamis-Roche method. Pediatrics 1994;94:504–7.
. Muscle strength and body size and later cerebrovascular and coronary heart disease maturity status and injury risk in youth soccer players. Sport Med 2010;20:131–5.
. Adolescent Growth and Motor Performance, 1988.
. Growth, maturation, and physical activity. Growth Matur Phys Perform 2004:1–17.
. Injuries in youth sports: epidemiology, risk factors and prevention. Dtsch Z Sportmed 2014;65:S248–52. Contributors AR designed and developed the research question and wrote the original version of the manuscript as part of his doctoral thesis. EW (doctoral supervisor) reviewed, designed and provided expertise to the study. AJ (doctoral committee member) was involved in study design. AF supervised and provided expertise with respect to the data analyses. RVe, SP and RVa (doctoral committee member) reviewed and provided expertise to the study. All authors have contributed to and edited the manuscript and have approved the final manuscript.